A little less than two weeks ago, Americans across the country –including the loved ones of four Americans murdered in Benghazi –learned that Hillary Clinton and the State Department ignored SIX HUNDRED emails begging for more security in war-torn Libya. Like myself, I’m sure all Americans — including those loved ones –are asking HOW could employees at the State Department and Hillary Clinton herself, completely ignore SIX HUNDRED pleas for help? How is it humanly impossible to ignore that many incoming emails? How is it morally possibly to ignore America’s heroes on the front line begging for help? Now we know. I assume, never guessing that her emails would be made public, Mrs. Clinton didn’t even FEIGN interest in the events unfolding for the day. 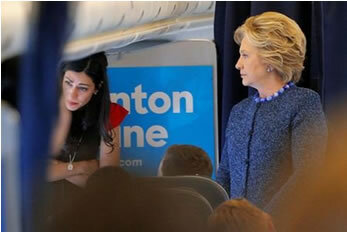 Instead, she went right to the subject of REAL import: Huma’s interior design quandary over lamps. Now the 600 unanswered pleas for help are sadly understandable. In my opinion, Mrs. Clinton saw her job as a stepping-stone, or maybe simply an opportunity to travel the world (setting a new record of over 956 MILLION miles), or just make new friends while waiting to be crowned America’s first female president. I’d say that Hillary Clinton had a bad week, except for the fact that bad weeks have become pretty much par for the course for the former first lady and 2016 presidential hopeful. First and foremost, there’s the investigation into her private email server. The number of emails containing classified information is now up to a whopping 305, and the odds are it won’t stop there. 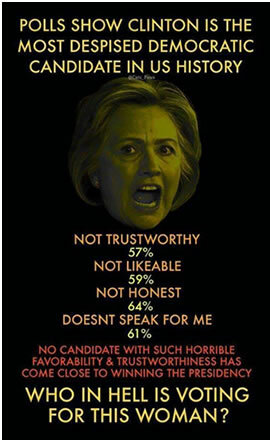 There’s also the matter of her failing poll numbers. The latest surveys show self-described socialist and genial nutcase Bernie Sanders within striking distance of Hillary, whose numbers have dipped under 50 percent for the first time — all without a long-rumored Joe Biden run. As you can see, the ad clearly contradicts everything that Clinton has been lying about. My comments: Is this “death by a thousand paper cuts?” Only in reality, political death by Obama dripping piece by piece against Hillary to the MSM? Remember, the Clinton’s and Obama’s detest each other. It wouldn’t surprise me if Obama comes out and backs Biden or Sanders for President, or maybe a late comer like Elizabeth Warren?! The tens of thousands of emails on Hillary Clinton’s private server from when she was secretary of state could also be on a second device or server, according to news reports. 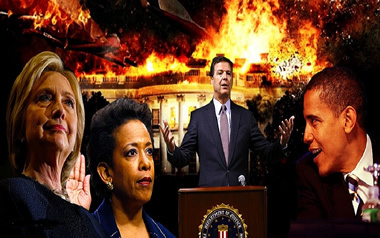 The FBI now has the only confirmed private server, as part of a Justice Department probe to determine whether it sent of received classified information for Clinton when she was the country’s top diplomat from 2009 to 2013. Platte River Networks, which managed Clinton’s server and private email network after she left the State Department, has indicated it transfer – or “transferred” – emails from the original server in 2013, according to The Washington Examiner. However, Clinton, the front-running Democratic presidential candidate, has suggested that she gave the department 55,000 pages of official emails and deleted roughly 30,000 personal ones in January, which raises the possibility they were culled from a second device. Neither a Clinton spokesman nor an attorney for the Colorado-based Platte River Networks returned an Examiner’s request for comment, the news–gathering agency reported Saturday. The DailyMail.com on Aug. 14 was among the first to report the possibility of a second server. The FBI took the server last week, after a U.S. Intelligence Community inspector general reportedly found two Clinton emails that included sensitive information, then asked the FBI to further investigate. Platte River Networks has told news agencies that the server, now in New Jersey, has been wiped clean. But forensics experts still might be able to recover some information. There have been reports that some of the emails that Clinton turned over included classified information. Clinton maintains that she neither sent nor received classified data, which suggests the missives might have been marked after the fact as classified or with some other top-secret classification. The emails that Clinton gave to the State Department were on multiple storage devices. A Clinton lawyer turned over at least one thumb drive that reportedly included copies of the emails that his client has already given to the federal government. Clinton has maintained that she has done nothing wrong or illegal and says she will cooperate fully with the non-criminal investigations. However, polls show the controversy and frequents news headlines have hurt the front-running Clinton among potential voters, who are increasingly questioning her transparency and trustworthiness. My Comments: Personally, from various articles and books on this subject, I believe the blame lies with the president even more so than Hillary. I fully believe Hillary was told what to say and do. This doesn’t excuse her from the responsibility of these peoples’ deaths. I’m just saying, there’s more than one responsible party here. Friday at the 2015 Southern Republican Leadership Conference in Oklahoma, former U.S. ambassador to the United Nations under President George W. Bush, John Bolton, said former Secretary of State Hillary Clinton is “responsible for the tragedy of the murder of U.S. Ambassador Christopher Stevens and three other Americans,” in the 2012 terror attack in Benghazi Libya. Kathleen Willey, one of the many women who accused former president Bill Clinton of sexual assault, told interviewers she expects a “scandal a day” during Hillary Clinton’s presidential run, adding that the former first lady had done nothing to deserve the post. “What has she done, what has she accomplished to run for president, to become the president of the United States?” Willey said. She also warned other women that the former secretary of state was not a candidate for women’s rights. “Women should pay attention to what she’s done to other women, and not just the women who were unfortunate to cross paths with her husband,” Willey said. In terms of rehashing the Clinton scandals, Willey said that Benghazi and the email server scandal was only the latest instance of a long career of shame for the former first lady. “She took it upon herself to erase all of her emails so that none of us can see what happened in Benghazi,” Willey said. “Their mere presence on the stage is going to guarantee the fact that we’re going to hear one of those scandals every single day that she’s running for the nomination. And then if she wins we’re going to hear about Travelgate and Vince Foster and Monica Lewinsky and me and all of the trouble they got themselves into in Arkansas. “The thing that boggles my mind is that doesn’t seem to bother her,” she continued. I’d disagree with Willey there. On a good week, it’s at least two or three. Willey, a former Democratic Party activist, alleged in 1998 that President Clinton had groped her in the Oval Office five years earlier. Willey has been subjected to a long campaign of harassment and character assassination ever since, although the former White House aide has stuck with and continued to publicly state her story. It’s a great irony that the first woman to have a reasonable shot at becoming president has gotten there merely by championing the public shaming of women simply unlucky enough to be hit on, if not sexually assaulted, by her own husband. With all of the hero-worship coming out of the media in the wake of Hillary’s announcement, it’s funny that there was little to no mention of the women whose life she’s played an active part in ruining. Give it time, though. No matter how complicit the media wants to be, the truth seldom stays buried for long, especially when the Clintons are involved. It is well-documented by the news media that as Secretary of State Hillary Clinton put our country’s security at risk by using an unsecured personal email account for sensitive State Department communication. Watch this video as it documents just exactly how dangerous her actions were, and help Patriot Voices PAC share this video in the media, online and in our grassroots communities by donating $25, $50 or $100 right now. If Hillary Clinton created this kind of disaster as Secretary of State, can we feel safe if she was our Commander in Chief? The State Department’s inspector general has agreed to investigate the program that allowed former Secretary Hillary Rodham Clinton to hire one of her key advisors, Huma Abedin, for government work even as she was also employed by a private firm, a senator revealed Friday.Inspector General Steve A. Linick also said he wasn’t aware of Mrs. Clinton’s or Ms. Abedin’s use of a non-government email account to conduct official business, and said that’s generally been frowned upon at the department. He pointed to a 2012 report that instructed an embassy to stop using a commercial email system as evidence.And Mr. Linick said he is looking into whether those employed as Special Government Employees – the designation Mrs. Clinton gave to Ms. Abedin – are following the law, and avoiding conflicts of interest. “The OIG intends to examine the department’s SGE program to determine if it confirms to applicable legal and policy requirements,” Mr. Linick said in response to a request from Senate Judiciary Committee Chairman Charles E. Grassley, Iowa Republican. Mrs. Clinton approved hiring Ms. Abedin, her long-time assistant, as an SGE, which allowed her to collect a government salary while also continuing to work for Teneo, a private firm. Mr. Grassley said there the usual conflict-of-interest questions in an arrangement like this are only heightened by the report that Ms. Abedin used the same non-official email server Mrs. Clinton set up for herself. Mr. Grassley also questioned whether Ms. Abedin was qualified to be designated an SGE, saying that privilege is supposed to be used to entice someone in the private sector to split his or her time, in order for the government to tap someone’s “special knowledge and skills.” In Ms. Abedin’s case she was already working for Mrs. Clinton when she was converted to an SGE, allowing her to then also take an outside job, Mr. Grassley said. “It is unclear what special knowledge or skills Ms. Abedin possessed that the government could not have easily obtained otherwise from regular government employees,” Mr. Grassley wrote to current Secretary of State John Kerry. The State Department has yet to respond to Mr. Grassley’s inquiry, the senator said. Ms. Abedin is married to disgraced former Rep. Anthony Weiner.